Life’s a little busy this week, so I’m going to combine my posts for Kitchen Tip Tuesdays and Works for Me Wednesdays . I mentioned before – I LOVE my Vidalia Chop Wizard! Last time I showcased this wonderful little gadget, someone commented that they were surprised that it could handle tougher veggies, like onions and carrots, so I thought I’d show how the chop wizard handles onions. Notice that I’m using the smaller chopping grate this time and check out the time on the little red clock. Again, I PROMISE you – I did NOT touch that little red clock! I just LOVE this thing! Chopped onions really are a breeze! I chop all the onions I’ve got, either using the chop wizard OR, when I’m really in a hurry, I use my Oster food processor attachment. 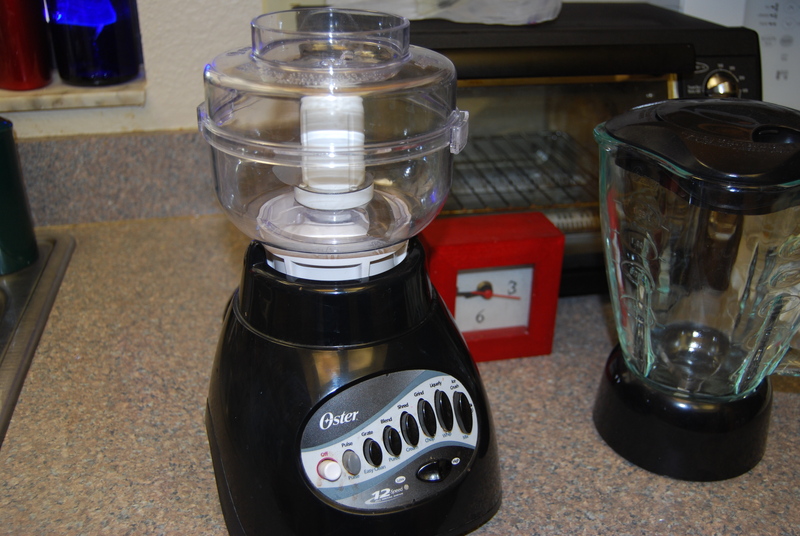 (I have a 1990 Oster Kitchen Center, but for smaller jobs, I keep my 2003 Oster blender on the counter because it takes most of the same attachments. Isn’t it cool that the attachments are interchangeable?) Anyway, I had an extra 5 minutes today and I really prefer the onions chopped in nice little squares – they’re just prettier than the shredded onion that the food processor produces. Then, I lay out the chopped onions on a large metal cookie sheet for flash freezing. Flash freezing refers to the freezing technique where you lay out something individually, best on a metal cookie sheet (it gets colder much faster than a cutting board), and freeze it quickly. It keeps the food from sticking together in a big frozen ball of goo. REALLY great for freezing any kind of berry! Then, I sit here for about a half an hour and write this post. (besides, I need my coffee.) I usually leave the onions in longer because I forget about them. If you can leave them for an hour or two, that’s actually better. I once left them in overnight with no problems. At a minimum, you want ice crystals to form. Later, when a recipe calls for onion, I’m ready! They defrost really fast! I leave the bag on the counter for a few minutes and when I take the slab of onion out of the the Ziploc, it just crumbles. Check out more great ideas at Kitchen Tip Tuesdays hosted by Tammy’s Recipes! Find even MORE ideas at Works for Me Wednedays hosted by Rocks in My Dryer! Don’t forget to enter this week’s clean sweep(stakes)! I also do this with Green Peppers. I just scoop out what I need to use for each recipe. 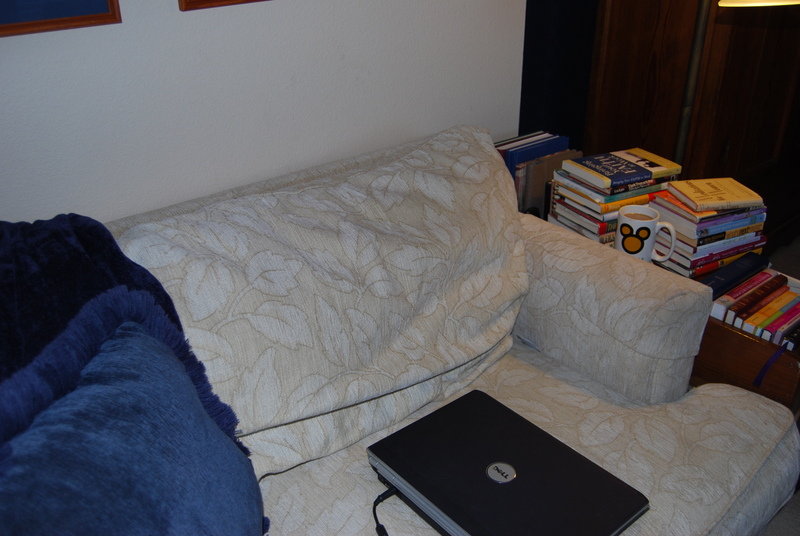 When I discovered the benefit of flash freezing, I thought myself Julia Child. I use it often. Do you have a similar tip though for flash freezing fresh herbs? Mine seem to lose their herb-iness once frozen. Thanks. Holy cow, you’re a genius! Love it! Of course I don’t have the chopper but I do have an absolutely wonderful knife that I can use. Does it make your freezer smell onion-y while it’s freezing, or while it is in the bag? It seems like a great idea because I hate chopping onions and pretty much always use my food processor for them! I love this idea! Within the last year I learned about freezer cooking, and love to hear new things that I can freeze! Thanks for the good tip! Awesome idea! I wondered if that really worked – gonna go buy one! They just happen to be on sale this week at CVS. Aha!!! So, THAT’S the best way to do it … Flash Freezing … I often wondered how they did the chicken at Costco (the frozen bagged stuff). Whenever I’ve frozen onions, they’ve come out a big globby mess! I’ll be doing this over the summer! Thanks for the awesome tip! Ha! I just did this with a 10 lb bag of onions, it was soooo insanely convenient for making dinner last night that I have no clue why I didn’t do it before. I had wondered about those chopping wizards, looks like they really do the trick, very cool! Thank you so much for the flash freeze idea for onions. Usually my onions ruin because I don’t cook that much but would like to have some on hand when needed. What I am concerned about is celery. I cook for one or two people at a time but you have to buy a whole bunch of celery and of course it ruins. Can celery be frozen as onions are? Just something I would like to know for have a receipe I would like to try for Easter and do not wish to buy so much celery. Can you slice the onions to make onion rings in the future? I really prefer the onions chopped in nice little squares – they’re just prettier than the shredded onion that the food processor produces. How can I create that? Does a food processor have such an attachment? Thanks so much. I linked to you today in my blog because it was so easy to flash freeze my onions that’s to your post. Keep the good stuff coming! Thanks for the idea. I am always throwing out half of an onion, because I don’t remember when I put it in a baggie in the refrigerator and I don’t know how long before it spoils.